In some workplaces, there are risks that may specifically affect the health and safety of new and expectant mothers and of their baby, and so there are special laws that employers must abide by to protect them. Different working conditions, processes or substances may pose a particular risk to new and expectant mothers, and these risks can change depending on the mothers’ health and stage of pregnancy. What should I do as a mother to make sure myself and my baby are protected? If you are pregnant, you have given birth in the last six months or you are breastfeeding, you are not required to tell your employer, but it is important for you and your baby’s safety that you do. The earlier you give them written notification the better. Not only does it mean that everything can be sorted for your maternity leave, but it means that your employer can carefully consider what risks you are exposed to in your workplace, whether the risks can be removed and whether any adjustment to your hours or working conditions need to be made. You can also discuss arranging more frequent rest breaks. If risks are identified that go beyond the normal level of risk that would be found outside the workplace and these risks can’t be removed, your employer may need to consider whether alternative work can be found for you or even if you need to be suspended on paid leave for a while to protect the health and safety of you and your baby. If you have been given special advice from your doctor or midwife then you should give this information to your employer so that they can bear it in mind when they review their risk assessment. The more open communication is between you and your employer the better, because it means that any issues or concerns can be dealt with quickly. If an employee notifies you that they are pregnant or breastfeeding, you need to revisit your risk assessment to identify any areas of risk that the employee may be exposed to. If these are more than the normal level of risk that would be found outside the workplace, you then need to think about whether these risks can be removed or, if not, what adjustments need to be made to protect the employee. If the risks can’t be removed, you may need to adjust the employee’s working conditions or working hours, find alternative work for them, or suspend them from work on paid leave until they are no longer at risk. The risk assessment should be regularly reviewed at different stages of a pregnancy and as circumstances change, even if no risks were initially identified. The risk of damage to the baby may rise at different stages of pregnancy, and the mother’s agility, co-ordination, speed and reach may change as the pregnancy progresses. You must provide suitable rest areas for pregnant and breastfeeding mothers, and the HSE recommends that you provide a private, healthy and safe place for nursing mothers to express and store milk. If an employee has told you that they are a new or expectant mother and you want help reviewing your risk assessment, or advice on what adjustments you can make to protect them, we can help. Call us on +44 (0)141 244 0181 or email info@amalgamate-safety.com. This entry was posted in Beginner's Guides to Health and Safety Requirements on 11/12/2018 by Alexandra Foulds. When we think of the nineteenth century we tend to think of it as the age of steam – the age of the steam engine, steam-powered factories, and iron and steelworks. In order to produce this steam, an easy source of ignition was needed. Up until the nineteenth century, fires would be lit with a flint and steel which would be struck together to release sparks. In the first half of the nineteenth century, however, the match was invented and its invention brought with it a new occupational disease. 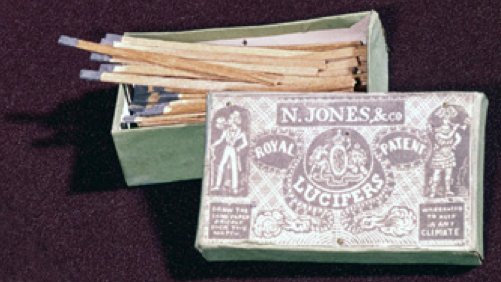 The first kind of match invented was called the lucifer match or the ‘strike-anywhere match’. Sir Isaac Holden MP claimed to be the inventor, saying that he demonstrated them in a chemistry lecture he gave in London. One of the men in the audience wrote to his father, who was a chemist, about it and ‘shortly afterward lucifer matches were issued to the world’. The tip contained white phosphorus, sometimes also called yellow phosphorus, which worked by a chemical reaction whenever the tip was struck and allowed it to be lit when it was struck against anything. White phosphorus, however, is highly toxic and produced a condition called phossy jaw or phosphorus necrosis of the jaw, a kind of bone cancer. In match-making factories, the people who worked as ‘mixers’, ‘dippers’, and ‘boxers’ would be exposed to vapours from the phosphorus. These fumes caused the bones in the jaw – usually the lower jaw – to start to rot. Sufferers would begin by experiencing painful toothaches, the gums would swell, and the infected bone would glow a greenish-white colour in the dark. Pus would start to form, causing tooth loss. Slowly the dead bone would separate from the living bone until the entire jaw bone had necrosed. The only treatment was to remove the infected jaw, leaving the patient seriously impaired. If this was not done in time, the disease would spread to the brain causing serious brain damage, before causing organ failure and death. The first case of phossy jaw was reported in Vienna in 1839 by the Austrian physician Lorinsor, who by 1844 reported 22 cases of the condition in match stick workers, establishing that the disease was caused by white phosphorus. By this time, however, the sale of lucifer matches had exploded, with women predominantly working in the factories that made them. By 1890, 60 tonnes of white phosphorus was being used in the match manufacturing industry in Britain. 50% of this was used by Bryant and May, a company established in 1843 at first to import matches but which then began to manufacture them. Bryant and May became notorious for their treatment of their workers in 1888 when one of the most famous early instances of industrial action took place – the Match Girls’ Strike. This strike took centre-stage in the British press at the time. 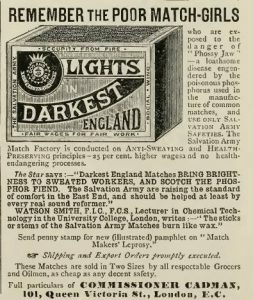 It started after the journalist Annie Besant wrote an article for the weekly paper The Link in July 1888 on the working conditions in match factories. In it Besant argued that the women involved in match manufacturing were dying for 4 to 13 shillings a week, with the average salary being 11 shillings and 2 pence per week, and often less due to illegal fines and deductions for materials made on their wages. Besant also noted that the workers ate their food in the same rooms that they were working in, ‘so that the fumes of the phosphorus mix with their poor meal and they eat disease as seasoning for their bread’ When the foremen noticed the swelling of the jaw that was one of the first signs of phossy jaw, she wrote, they sent the worker home and she got ‘no pay during her absence’. 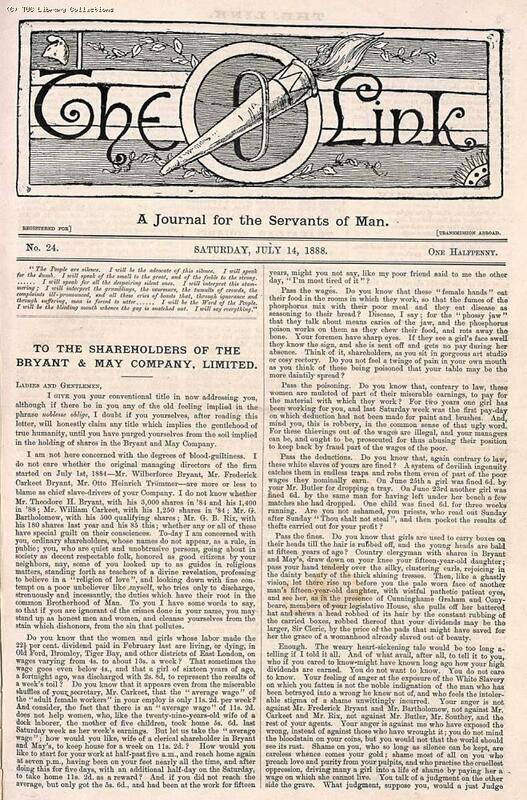 The management of Bryant and May tried to get their workforce to sign a paper contradicting the facts in Besant’s article and after a group of women refused to do so the organiser of the group was dismissed, supposedly for refusing to follow the foreman’s instructions, setting off the strike. Approximately 1400 women and girls refused to work, forming the Matchgirls’ Union and approaching Annie Besant to help them make their demands. 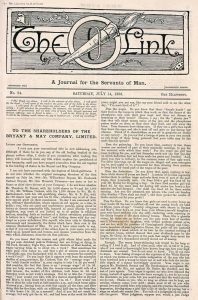 Several prominent figures, including George Bernard Shaw and William Stead, the editor of the Pall Mall Gazette, joined the campaign for better working conditions in the factory, with many advocating the boycott of Bryant and May’s lucifer matches, while other newspapers like The Times labelled Besant and the strike’s supporters as agitators and ‘pests of the modern industrialized world’. After three weeks terms were made and the company announced that it would re-employ the sacked employee, end the fines system, introduce a system so that complaints could be taken to the managers instead of having to go through the foremen, and that food would be eaten in a separate room. Despite the publicity caused by the strike, white phosphorus continued to be used in Bryant and May’s manufacturing of matches until 1901, and it wasn’t until 1910 that the use of white phosphorus in matches was banned in Britain. The sad fact is that white phosphorus continued to be used for so long not because there wasn’t an alternative, but because of production costs and consumer demand. 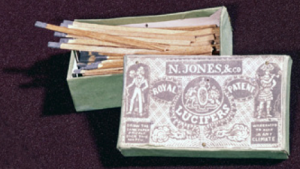 Since the 1850s Bryant and May had been importing ‘safety matches’ from Sweden, which used less toxic red phosphorus instead of white and needed to be struck against the side of the box. After 1855 Bryant and May started manufacturing them themselves, but they were not as popular and were far more expensive to produce and therefore more expensive to buy. 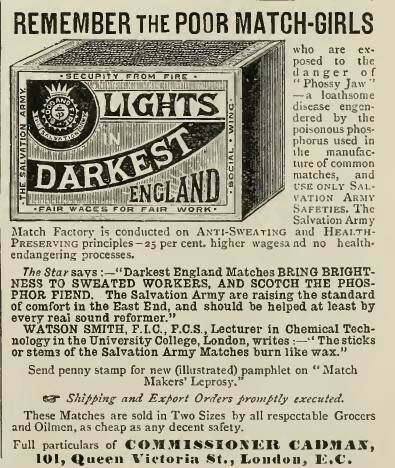 In 1891 the Salvation Army opened its own factory producing safety matches in an effort to improve the working conditions of match manufacturers, but they continued to use child labour to box the matches to try to keep the costs down so that they could compete, and they still cost three times the price of lucifer matches, so eventually the factory had to close and was taken over by Bryant and May in 1901. It has been just over a year since the Grenfell Tower tragedy, the worst residential fire in the UK since World War 2. 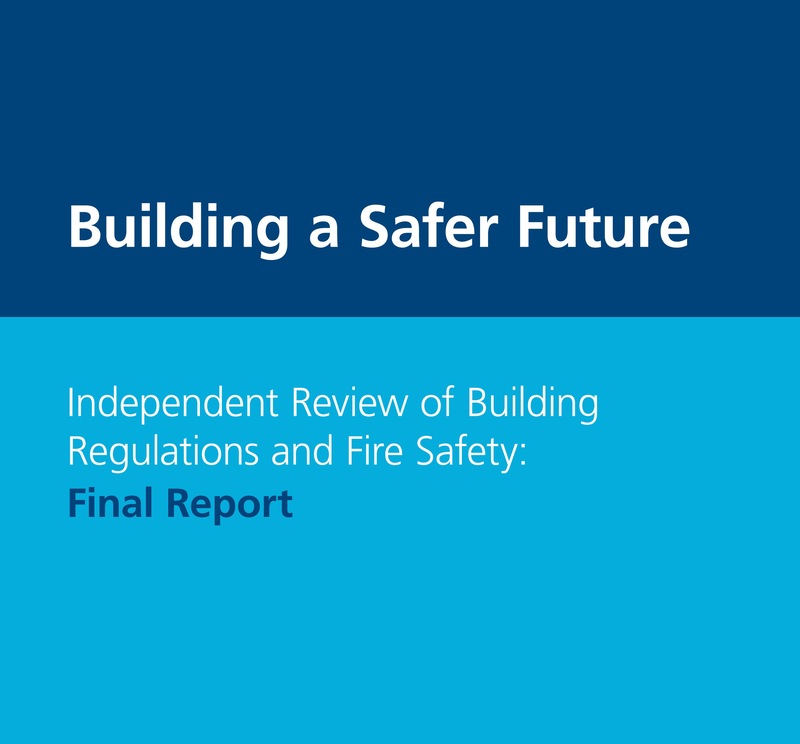 It has also been just over a year since, in response, Dame Judith Hackitt – former chair of the HSE – was asked to undertake an independent review of the effectiveness of building and fire regulations on high rise buildings. 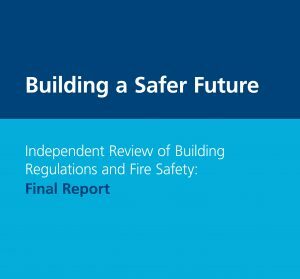 Unlike the public enquiry launched at the same time, which will investigate the causes of the Grenfell fire and the type of cladding used, Hackitt’s purview was to assess the system of safety regulations regarding high rise buildings. According to Hackitt, the call for evidence that her report instigated made it clear that the current regulation system is weak and ineffective because it is confusing, inconsistent, ineffectively applied, and too easy to find ways around. Hackitt’s report reveals several flaws in current regulations. She discusses the fact that at the moment there are two parallel sets of regulations which come into play with regard to high rise buildings: CDM, which is focused on the safety of workers and does not apply to residents, and the building and fire safety regulations, which apply to occupants. She argues that this overly complex and impractical system needs to replaced by a much simpler version. She notes that there are currently different regulations for common parts of high rise buildings and individual residential units, and suggests that fire prevention and fire control can only be truly effective if the entire building is treated as an integrated system. She argues that there is an obvious conflict of interest in companies being permitted to pay an inspector to regulate them when these inspectors have no power of enforcement and their only recourse is to make a report to the local building control. Finally, she contends that the current sanctioning system for those who do not comply with regulations is inadequate, as prosecution cases are generally not pursued as the cost of the case tends to be higher than the penalty. The solution, according to Hackitt, is an overhaul of the whole system, and her report makes 53 recommendations to create a simpler but more robust framework for high rise buildings. In these recommendations, she advocates for a stronger and tougher regulatory regime, with a stronger enforcement and sanctioning package so that failures to comply are met with criminal sanctions and large fines. She recommends the creation of a new regulatory body that will produce simpler, detailed guidance on how to meet regulatory standards. She advises that the current permissioning regime in Scotland, in which only buildings demonstrated to be safe are allowed to break ground and to be occupied, be enforced throughout the UK. She argues that there must be a clear duty holder at every stage of the construction process and that competence needs to be increased throughout the construction sector. Having repeatedly heard during her investigation about the difficulties residents had often faced in raising their concerns, she also emphasises the importance of empowering residents to report any dangerous occurrences and providing a clear means for them to do so. Her report, then, suggests actions to be taken both by the government and by the construction industry. The legislation will take time, and it won’t be until early Autumn when we will know exactly how these new processes will be put in place. The changes are coming though, and they will apply to both new builds and buildings that are currently in use. Hackitt’s recommendations will, at least at first, only apply to high rise buildings with 10 floors or more, which some are suggesting is too limited. However, this already means that when the new regulations come into force 2000-3000 buildings will have to be reviewed. Until legislation comes into force, it is suggested that construction companies should implement the suggested changes to their systems when constructing or refurbishing high rise buildings as good practice, to avoid having to do additional work later. If you would like advice on how to adapt your building or fire safety systems to be in line with the recommendations in Hackitt’s report, contact us on 0141 244 0181 or email info@amalgamate-safety.com. Each year in the UK approximately 137 million working days are lost due to sickness absence, costing UK businesses in the region of £16 billion per year. This averages out to about 6 days off per person per year due to sickness, but the reality is that some of these are longer-term health issues resulting in employees taking weeks or even months off work. These absences can have a significant impact on businesses, especially SMEs. Occupational Health services can help organisations by reducing sickness or injury absence, while also improving staff productivity and morale. Amalgamate can provide Occupational Health services at your workplace, for preventative, health surveillance or treatment plan purposes. Our OH Practitioners can assess staff for Fit to Work certification, to confirm if they are able to perform standard and/or safety-critical roles. They can also monitor health issues for preventative care, including vision and hearing tests, lung function testing, blood pressure and BMI monitoring. Where an employee has a serious or ongoing health problem, our specialist practitioners can conduct an Occupational Health Assessment. This will assist in the development of a plan to help them continue or return to work safely, and to establish any adjustments that could be made to help them to work, while protecting their health. It also offers reassurance to employers that they have a good understanding of the state of their employee’s health. All these services can contribute to improved levels of employee wellbeing, as well as reducing absence levels and their associated costs. The aim of Occupational Health Services is to promote and maintain the health and well-being of employees, ensuring a positive relationship between an employee’s work and their health. This means not only coming up with preventative and health surveillance plans to try to make sure that employees’ physical and mental health is safeguarded as much as possible, but also offering additional support to employees if it is needed. If an employee undergoes an Occupational Health Assessment, this can help their employer to better understand the problems they’re experiencing and how they affect their ability to work. Our expert advice can help remove barriers to a successful return to work or, if they’re still at work, ensure that they can continue to work safely. Occupational Health Services can reduce the likelihood of work-related illness or injury, and can improve the experience of employees dealing with sickness absence or the return to work process. More details of the Occupational Health Assessment process can be found here. If you’d like to learn more about the Occupational Health services we provide, call us on 0141 244 0181 or email health@amalgamate-safety.com. A fire in the workplace is the kind of risk that many businesses put off thinking about. It is a fairly rare occurrence, but if one happens, the effects can be extremely grave and hard to recover from. Consequences could include death or severe injury, as well as loss of property, data, plant or machinery, severely impacting your organisation. The Civil Contingencies Service states that 80% of businesses that suffer a major disaster, such as fire, go out of business within 3 years. So reducing the risk of fire to the lowest possible level is critical. There are several different elements which combine in order to do this, from assessing your workplace and checking that all fire-detecting and fire-fighting equipment is functioning, to drafting evacuation plans, and training staff in evacuation procedures and the use of fire extinguishers. That can be a lot of work, and it requires a lot of specialist knowledge, which is why using a health and safety company, like Amalgamate, can help to put your mind at rest that you are doing everything you need to. The first vital step to prevent fire in the workplace is to conduct a Fire Risk Assessment. This will establish where danger lurks at your property, and what specific risks are relevant to the premises. It must be conducted by a competent person and reviewed regularly to make sure that nothing is being missed. Amalgamate have provided FRAs to a wide range of clients, including for A-listed buildings of national significance, commercial buildings, hotels, offices, leisure facilities, breweries and hospitality venues. So whatever your line of business, we’re ready to help. We provide you with a clearly laid out report which will give you all the guidance you need to make the changes that will protect your organisation, as well as keeping you in line with all your legal obligations. Our assessors are true experts – they’re all former fire officers, with experience and qualifications in a range of specialist subjects, including fire regulations, human behaviour in fire situations, and fire alarm systems. They have a thorough understanding of the contributory factors that allow fires to occur, and the means of preventing them. Equally important to the prevention of fire in the workplace is your Fire Safety Plan, which should consider how you can reduce the likelihood and spread of a fire, how warning will be given in the case of a fire, what equipment is, or should be, provided to fight a fire, the action that should be taken in the event of a fire, how to safely evacuate all employees, visitors, and vulnerable people, and what fire safety training staff require. Amalgamate, with the help of our fire safety experts, can help you to develop your Fire Safety Plan. Finally, staff training plays an often underestimated role in preventing fire in the workplace. Companies are required by law to have enough designated Fire Wardens to cover the size of the building, its number of occupants, and the risk level of the business. Amalgamate would always recommend that you have at least two trained Fire Wardens to help ensure that holiday and sickness absence are covered. We offer Fire Warden training courses that are delivered by highly experienced professionals, who have worked for many years in the UK Fire and Rescue services as operational firefighters and fire safety educators. This means that they have the knowledge and experience to deliver courses that are relevant, realistic, and interesting. We run practical sessions, where the trainees head outside to take part in live fire training under controlled conditions. This gives them the opportunity to extinguish a real fire, using the same extinguishers that are used in your workplace. The instructor will work with the trainees to ensure the best, most realistic experience in a safe environment. The more staff members you have who are well-trained in fire safety strategies – who have been shown how to use fire extinguishers (and, crucially, know when it is appropriate to try to tackle a fire themselves), who ensure that escape routes are kept unobstructed, and who know by heart the procedures to follow – can make the difference between a small incident, and a potentially tragic event. Unfortunately, companies often have a Fire Safety Plan that sits in a folder, fulfilling legal requirements, but that staff members are unfamiliar with. Ensuring that Fire Safety Plans are communicated to employees, fully understood, and actively integrated into working practices, requires a pro-active approach that includes regular staff training/instruction and fire drills. If you would like to know more about fire safety or to enquire about our range of services, call us on 0141 244 0181 or email info@amalgamate-safety.com. When the Huguenots (Calvinist French Protestants forced to leave France after the Edict of Fontainbleu, which made Protestantism illegal in France) arrived in Britain in the late seventeenth century they brought with them a new method for making felt, and a new occupational disease – erethism, or mad hatter syndrome. The new method involved the treating of fur from animals such as rabbits, hares and beavers with a diluted solution of mercuric nitrate. The skins were then dried in an oven before being stretched over a bar in a cutting machine. The pelts were then sliced off in thin shreds and layered onto a conical mould, where they would be pressed and shrunk with steam and hot water. The resulting felt could then be dyed and made into fine hats. The method was referred to as carroting as the mercuric nitrate solution turned white fur a reddish brown colour. The advantage of this method was that it made the outer stiff hairs on the pelt soft and limp, and twisted and roughened them so that they matted together more easily. The problem was that the treated felt released mercury as a vapour, and felt-making tended to be done in small, confined and poorly ventilated spaces. As a result, hatters began to present the symptoms of mercury poisoning. These included physical symptoms, such as slurred speech, headaches, weakness and tremors; and neurological problems, such as personality changes – irritability, anxiety, low self-confidence, depression, apathy, and shyness – as well as memory loss, delirium, and hallucinations. These symptoms were known to be caused by mercury, which had long been prescribed as a cure for syphilis by being rubbed on the skin, injected or taken orally. A night with Venus, it was said, was followed by a lifetime with Mercury. However, there were no laws to regulate the use of mercury in industry, meaning that the symptoms of mercury poisoning in hatters were prevalent enough that the expression ‘mad as a hatter’ emerged in 1829, the same year a report on the syndrome was published in St Petersburg. 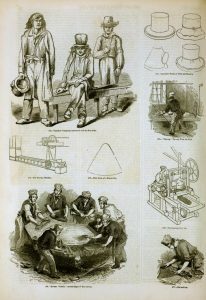 In 1860 a report was published in the Transactions of the Medical Society of New Jersey by J. Addison Freeman on ‘Mercurial Disease Among Hatter’s, and in 1869 the French Academy of Medicine also described the health risks associated with hat making. In France this led to a law being passed in 1898 to protect hatters, however in the United States mercury was used in hat making until 1941, despite the fact that in 1888 a new method using hydrochloride was patented. In Britain in the 1890s, factory inspectors began taking note of any deaths and illnesses linked to working with mercury. Their evidence led, in 1899, to mercury poisoning becoming a disease that must be reported under the Factory and Workshop Act of 1895. While the aim had been to try to assess the scale of the danger from exposure to mercury for hat makers and the makers of scientific equipment, the new regulations demonstrated that mercury was used in a wide variety of industries. In the twentieth century in Britain the problem of mercury poisoning continued to be discussed and investigated, however, little changed in terms of legislation. An article in the medical journal the Lancet in 1912 speculated that the continued use of mercury in hat making may pose a risk to the wearers of felt hats, as ‘a “hat body” may contain as much as 0.138% of mercury’. In 1919 at the International Labour Organisation conference, the question was raised as to whether the use of mercury in hat making should be banned as it had been demonstrated in France that it was not needed. However, the suggestion was not taken any further. Since the end of the nineteenth century, however, mercury had been used less and less in hat making anyway, and ventilation had significantly improved, meaning that from the beginning of the twentieth century the number of cases reported was low enough that it was never considered a big enough problem to require specific legislation and so it simply remained monitored. From the 1940s hydrogen peroxide became used to create felt instead. 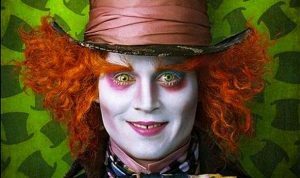 Many have argued that the Mad Hatter in Lewis Carroll’s Alice in Wonderland (1865) is meant to be suffering from mercury poisoning due to his occupation. 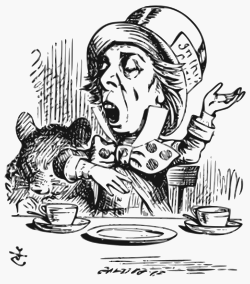 Others have objected that the Mad Hatter does not demonstrate the shyness and difficulty socially interacting with others that characterised mad hatter syndrome, arguing that the Mad Hatter was based on the real life furniture dealer Theophilus Carter, who was often called the mad hatter due to his eccentric character and the fact that he always wore a top hat. In either case, the strong links between hat making and aberrant behaviour in the nineteenth century are evident. These associations have been built into many later depictions of Carroll’s character. In Tim Burton’s movie adaptations of Alice in Wonderland (2010) and Through the Looking Glass (2016) the orange marks on the Mad Hatter’s skin and the orange colour of the Mad Hatter’s hair recall the symptoms associated with carroting and Johnny Depp said of his interpretation of the character that he had been ‘poisoned […] and it took effect in all of his nerves. It was coming out through his hair and through his fingernails, through his eyes’. Dust – a seemingly innocuous substance that makes many people sigh as they think about having to get out the feather duster. Yet as several high profile campaigns over the last couple of years – such as IOSH’s No Time to Lose campaign – have highlighted, breathing in many kinds of dust, especially those created by construction, can have serious effects on people’s health. What we tend to think about less is the flammable risk associated with dust. What many people don’t realise is that many of the powders we have in our homes are extremely flammable under the right circumstances. Things like flour, coffee, sugar, cocoa, corn flour, and chilli powder have the potential to cause massive explosions if they are released into the air as a dust and then exposed to an ignition source, such as an open flame, static electricity or even a very hot surface. This is because of each dust particle’s very large surface area compared to its mass, which means that it will burn much faster and catch on fire with much less energy than when the same substance is in a pile. This means that even materials thought of as nonflammable or as slow burning can be extremely flammable in their dust form. It takes as little as 2 grams per cubic foot of air for the household powders listed above to become ignitable. If combustion occurs in a confined space, the pressure that builds up can cause shockwaves, doing serious structural damage to buildings, and sending objects and debris flying. These explosions can then shake up more dust, causing a second explosion. While it is unlikely that people will be exposed to these hazards in their homes, in the factories and mills that produce these powders the dangers are very real. It is estimated that 2000 dust explosions occur in factories and refineries a year in Europe. While many of these are relatively minor, throughout history there have been many, at times disastrous, combustible dust explosions. The first recorded dust explosion was in 1785 in Turin, when flour dust in Giacomelli’s Bakery Warehouse came into contact with a lamp, injuring two employees. Throughout the nineteenth century there were many dust explosions throughout Europe and the United States, several of which completely destroyed the mills they took place in. The most notable was in 1878 in Minnesota, when a buildup of flour in a mill caused an explosion that killed 18 people. The blast was so powerful that limestone blocks were sent flying, and windows in neighbouring towns were broken. In the early twentieth century, in 1916, a dust explosion at the Quaker Oats Cereal Factory in Petersborough, Ontario killed 23 of the factory’s workers and destroyed the entire building. An explosion of a silo storing 4500 tons of a mixture of ammonium sulphate and ammonium nitrate fertiliser in Germany in 1921 is estimated to have killed between 500 and 600 people and injured 2000 more. The worst flour mill explosion on record occurred in Westwego, Louisiana in 1977, when a buildup of grain dust came in contact with static electricity. The explosion caused 49 silos to catch fire, killing 36 workers, many from being crushed by the collapsing silos. Building code reforms for grain silos were based off this event. In 1981, there was a dust explosion at the Bird’s Custard Factory in Banbury. A hopper – a container used to hold particles that have been collected from expelled air – became overfilled, creating a dust cloud of corn flour that ignited due to nearby electrical equipment. The explosion blew the roof off the building and 9 workers were injured. As custard is made when heat and water are added to custard powder, the water from the fire engines that came to put the fire out created gallons of custard inside the building, which then came pouring out. More recently, in 2008, there was a dust explosion at the Imperial Sugar Refinery in Georgia that killed 13 workers, hospitalising 40 more. The main damage was caused by a second explosion as sugar stirred up by the first explosion ignited, demonstrating the importance of proper housekeeping. Identify and classify areas of the workplace where explosive atmospheres may occur, and avoid ignition sources in those areas. In a workplace containing potentially flammable atmospheres, employers must make sure that any explosion safety measures are confirmed as being safe by an expert in the field of explosion protection. 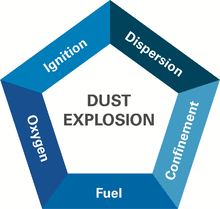 Unfortunately, when dust explosions happen it is often due to poor maintenance, deficient housekeeping, inadequate inspection regimes, or because something has been missed in a risk assessment. In all of these situations Amalgamate can help, whether it is by doing hazard identification exercises and hazardous operations reviews to make sure that all potential hazards have been considered and that adequate controls are in place, or by carrying out regular systems audits and site inspections. Contact us on 0141 244 0181 or visit our consultancy page.